Most cancer drugs are designed to halt cell growth, the hallmark of cancer, and one popular target is the pathway that controls the production of a cell’s thousands of proteins. UC Berkeley researchers have now found a promising new drug target within that pathway that is appealing, in part, because it appears to control production of only a few percent of the body’s many proteins, those critical to regulating the growth and proliferation of cells. The target is a protein that binds to messenger RNA, or mRNA – the cell’s blueprint for making protein – and helps get it started along the production line that ends in a fully assembled protein. A drug blocking this binding protein could shut off translation of only the growth-promoting proteins and not other life-critical proteins inside the cell. The finding was a surprise because the protein is part of a larger assembly of proteins called eIF3 — eukaryotic initiation factor 3 — that has been known and studied for nearly 50 years. Binding between eIF3 and these mRNAs opens up a pocket in eIF3 that then latches onto the end-cap of mRNA to trigger the protein production, or “translation,” process. Lee and Cate’s research hints that this secret lever, which triggers translation of only a special subset of mRNAs — perhaps only 500 out of some 10,000 mRNAs produced by a cell — will be found to play a critical role in other diseases besides cancer, as well as in plants and animals. The new findings by Cate, Lee and their UC Berkeley colleagues will be published online July 27, and in the Aug. 4 print issue of the British journal Nature. Cancer is characterized by uncontrolled cell growth, which means the protein production machinery goes into overdrive to provide the building materials and control systems for new cells. Hence, biologists for decades have studied the proteins that control how genes are transcribed into mRNA and how the mRNA is read and translated into a functioning protein. One key insight more than 40 years ago was that a so-called initiation protein must bind to a chemical handle on the end of each mRNA to start it through the protein manufacturing plant, the ribosome. Until now, this initiation protein was thought to be eIF4E (eukaryotic initiation factor 4E) for all mRNAs. Earlier this year, Cate and Lee discovered that for a certain specialized subset of mRNAs — most of which have been linked somehow to cancer — initiation is triggered by a different protein in eIF3. Before, that protein was thought to be just one of a dozen or so general initiation factors required for mRNA translation. Instead, they discovered that eIF3, an assembly of 13 separate proteins, binds to unique three-dimensional structures found only in this special subset of mRNAs. 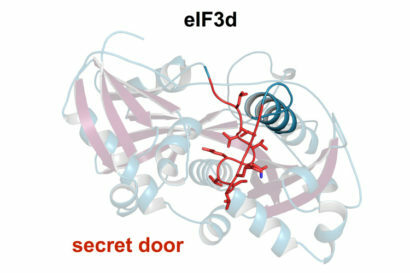 Subsequent X-ray crystallography of eIF3d revealed the structural rearrangements that must occur when eIF3 binds to the mRNA three-dimensional structures and which open up the secret compartment. The researchers plan further studies using cryoelectron microscopy to locate the actual trigger that opens the compartment. “Basically, we found the button that opens the secret door, but we don’t really know what the button looks like yet,“ Cate said. In addition to Cate and Lee, the coauthors of the paper are Jennifer Doudna, a UC Berkeley professor of molecular and cell biology and of chemistry, and Doudna’s former postdoc Philip Kranzusch, now a member of the faculty at Harvard Medical School and the Dana-Farber Cancer Institute. The work was funded by the National Institute of General Medical Sciences through UC Berkeley’s Center for RNA Systems Biology. Cate and Doudna are faculty scientists at Lawrence Berkeley National Laboratory.